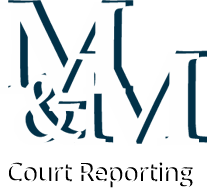 M&M Court Reporting transcribes recorded media for the legal industry. Have your recorded hearings, trials, motions, interviews, meetings, etc., transcribed by our experienced, dedicated team of professional, Certified Court Reporters familiar with such proceedings. When you require professional quality, fast turnaround, and stellar service, you can count on M&M to deliver. Whether you’re a large law firm or a solo practitioner, we can assist you. For more information about M&M's accurate and cost-effective legal transcription services, please give us a call to discuss your transcription needs.